The two main species of fox that are native to Alaska, are the Arctic and the Red fox; The Red fox being the most commonly spotted. These Alaskan mammals are recognized for their white-tipped tail and reddish coat, which can vary in color. They prefer to dwell in regions containing lowland marshes, hills, and “broken” country. At the same time, they have also been known to thrive in areas close to humans, which places them in danger of hunters and vehicle collisions, making their rescue essential. The main species of wolf that is native to Alaska is the Gray wolf. These predators generally hunt in packs of six to seven, and mainly prey on herd animals and moose. Wolves are spread all throughout Alaska and do not have one set location. 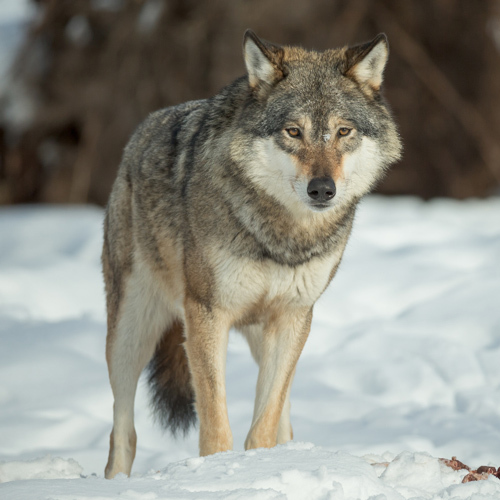 Hunters and trappers are the main threat to these Alaskan wolves, which makes their need for rescue paramount. Coyotes are a highly abundant canine species, whose highest densities are located in the Southeast and Interior of Alaska. They are easily recognized by their bushy tail and their sharp- pointed snout and ears. These Alaskan predators prey on everything from small rodents to larger animals, like the Dall sheep. 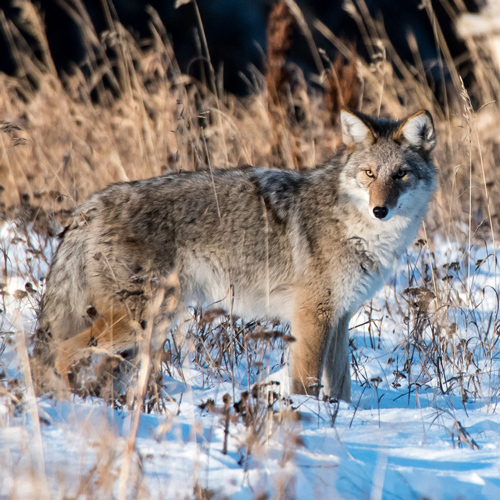 Unfortunately, the growing number of hunters, vehicle collisions, and mass human development expansion is threatening the coyote species, making their rescue essential for their survival. What do I do if I find a baby fox, baby wolf or baby coyote? 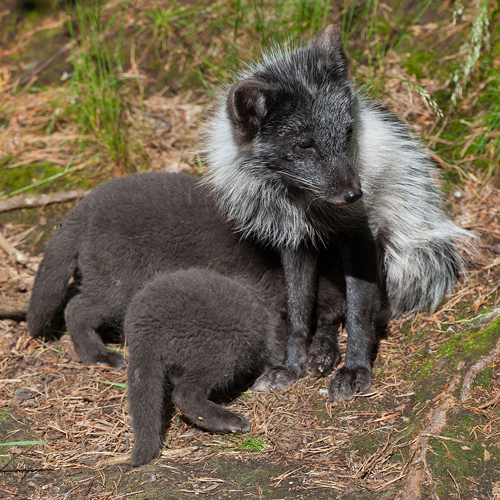 If you come across a baby fox, wolf, or coyote, it is important to note that it is common for pups to become curious and wander away from the rest of the litter. Remember to keep your distance from the pup while you wait to see if it reunites with its’ mother. If an excessive amount of time goes by, and the pup is still alone, please contact Alaska Wildlife Rescue for further assistance. Is there a den nearby? Is the baby near a road? Any obvious injuries you can see? What do I do if I find an injured fox, wolf or coyote? 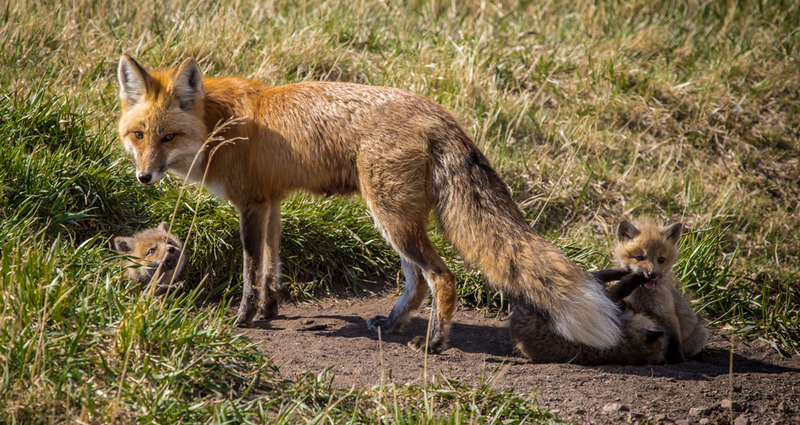 If you come across and injured fox, wolf, or coyote, it is important to keep your distance. If the animal is distressed, it is more likely to attack. Do not attempt to lift or move the animal on your own because this could ultimately lead to further injuring the animal and yourself. For assistance, please contact Alaska Wildlife Rescue, immediately. Is the animal near a road? Is the animal not afraid of humans? Is it night or daylight out? Do you see any obvious injuries? Can you safely get a picture? Alaska Wildlife Rescue needs your help! Your gifts are always greatly appreciated. Please consider supporting us or becoming a volunteer.